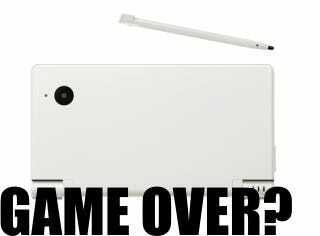 Is The Nintendo DSi Dead? First released in Japan in Fall 2008, the Nintendo DSi brought a new era to Nintendo's handheld gaming with a low-res camera. That era, it seems, is apparently finished. According to a Japanese retail source, the Nintendo DSi seems to be out of production. The available DSi consoles are apparently only those currently in inventory, and there are supposedly areas where it is sold out. However, the DSiXL (or DSiLL as it's called in Japan) still seems to be in production. With the Nintendo 3DS coming out shortly, Nintendo might want to avoid consumer confusion between the similarly-sized 3DS and the DSi. If this is true, don't look for Nintendo to cease support for DSiXL just yet. The console still fills a gap by offering the DSi experience, but on larger scale.